Boca Del Rio, not Del Boca Vista. Del Boca vista was a retirement community in Florida where Jerry’s parents lived in the sitcom Seinfield. I don’t know why I kept refering to this place as Del Boca Vista but I had been. I made my friend Gloria tag along with me on this long journey out of Los Angeles into the San Gabriel Valley and the whole time I told her I was taking her to a restaurant called Del Boca Vista. 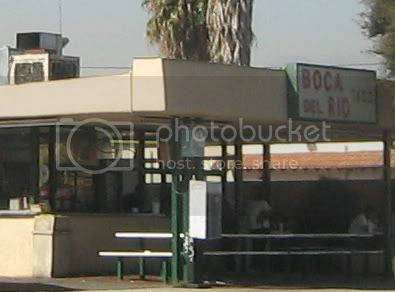 But as we got to the address it was Boca Del Rio. “this is the restaurant pendejo!? we came all the way for this?” she said. Point taken. I promised dinner at a restaurant and here we were at a run down taco shack in La Puente that looked like it hadn’t been remodeled since the 80’s. The tacos at boca del rio are loaded.Too loaded actually. Two corn tortillas packed with meat, guacamole, sour cream, jack cheese, and a squirt of salsa roja.I ordered the trifecta, carne asada, carnitas and al pastor. Gloria had a carne asada burrito. I’m partial to the simple authentic street taco(meat, onions, cilantro, salsa) so it takes alot for a non-traditional taco to win me over. But I like when a taco shack adds it’s unique take on the taco and Boca del rio succeeds in doing that. But I couldn’t eat this kind of taco all the time. They are just too heavy. The sour cream, guacamole and cheese dominates the taco. There were bites where all i got was cheese, cream and guacamole and I had to make use of the fork because structurally the taco didn’t hold up. Overall these were good but Gloria’s burrito made me jealous. I could smell the fresh refried beans and the jack cheese melted together, the meat bursting out and the sour cream and salsa dripping down the side of the flour tortilla. She enjoyed it as well and I was off the hook. 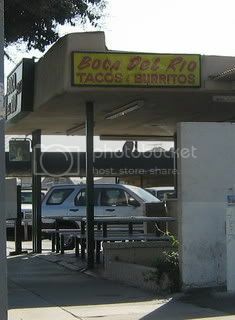 I've also found that at certain taco stands of this variety, the burritos are better then the tacos. Probably because you truly can't improve upon the street taco's simplicity but you can load up a burrito and make it even tastier then just meat, salsa and tortilla. You are really hitting the stride Bandini--not just imagining the amount of tacos you have been eating, but with your writing. The Boca del Rio episode of Taco Hunt is one of my favorites so far....! Wow, this is a blog I gotta show my mom (who is on a similar hunt, for great Mexican food in general and particularly tacos & tamales) - here's to you finding more 5 taco digs! why do you all call it a "street taco"? it's the same as the ones in the restaurant. Yay! You made it out to my home taco stand. And no, they haven't changed a thing since they opened in the mid-80's. If you thought the burrito looked good, try an asada quesadilla (not on the menu). Thanks for the review! My home town taco stand!!! I was searching around to find a review of some sort to show my friends in college who have never had the greatness that is BOCA. I go to school in San Diego but I make sure to go to Boca whenever I come home. Thanks for showing some love to this girls fav. taco spot! Bandini, I agree with you 100% on this one. The first time my friend took me to Boca, I was disappointed when I saw the tacos. But once I tried them, I really enjoyed them! 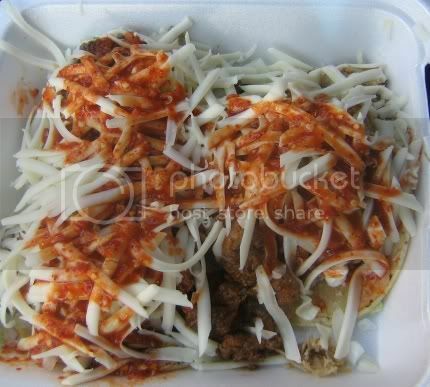 You gotta be in the mood for that type of taco, but if you are, they are the BOMB!